This website is operated by the Centre for Ecology & Hydrology (CEH). This privacy notice tells you what to expect when your personal information is collected. It will be revised as required and you are encouraged to revisit the privacy notice regularly to read the latest version. This version is dated 24 May 2018. Please read the following carefully to understand our views and practices regarding your personal data and how we will process it. By visiting www.ceh.ac.uk and affliated websites you are accepting and consenting to the practices described in this policy. The Centre for Ecology & Hydrology (CEH) is part of the Natural Environment Research Council (NERC) which is one of nine partners within UK Research and Innovation. The relevant section of our privacy notice will depend on the purpose of your visit to our website. We use the following lawful grounds for processing personal information to support our work when we carry out processing in pursuit of our purposes laid out in Article 93 of the Higher Education and Research Act 2017: in the most part, our lawful basis for processing your personal information falls under Public task, ie the processing is necessary for us to perform a task in the public interest or for our official functions, and the task or function has a clear basis in law, but we also make use of Contractual, Legitimate and Consent-based processing. In those instances where your information is being processed outside of the UK or EEA, we work with our partners to do all we can to ensure your personal data is processed in line with the data protection requirements of GDPR and the DPA 2018. The CEH website is hosted by Pantheon in the USA and covered by the EU - US Privacy Shield. Some of our newsletters are hosted by Mailchimp, which is also certified by the EU-US Privacy Shield. For further details on individual rights, please visit the ICO guide to GDPR. The lawful basis for CEH processing personal data can affect which rights are available to individuals. For example some rights will not apply. If we are processing your data on the basis of contract, your right to object and your right not to be subject to a decision based solely on automated processing will not apply. However, you will have a right to data portability. If your data is being processed on the basis of legal obligation, you have no right to erasure, right to data portability, or right to object. Your rights to erasure and data portability do not apply if your data is processed on the basis of public task. However, you do have a right to object. 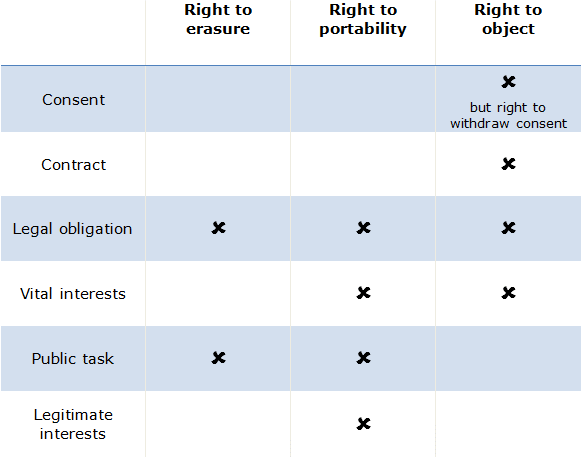 Where CEH is relying on legitimate interests, the right to data portability does not apply. Providing individuals with privacy information at the time we collect their personal data from them. if we plan to disclose the data to someone else, we will do this at the latest, when the data is disclosed. UKRI/ NERC/ CEH undertake an information audit to find out what personal data we hold and what we do with it. UKRI/ NERC/ CEH put ourselves in the position of the people we’re collecting information about. When providing our privacy information to individuals, we use a combination of appropriate techniques. Where this privacy notice applies to hosted / affiliated websites, the site will provide a link to this privacy notice, along with any additional privacy information that is applicable. We use different methods to collect data from and about you on our CEH-hosted websites. Your information is used to deliver services you have requested and to contact you, including but not restricted to, software downloads, data licensing requests, publication orders, registration on training courses, subscription to our newsletter and general enquiries, as well as to improve the website experience for our users. your name, address, email address, telephone number, organisation, where you have specifically provided this information on a web submission form. Some parts of CEH may use third party services including Twitter, Facebook, Microsoft O365, Outlook and Google+ as a method to allow you to share content. CEH uses Mailchimp for distributing some of its newsletters. See more details of our third party usage.